NCDD's 2016 winter seminar "Cannabis and Cars" was held in Santa Monica, California and attendance of attorneys from around the country was nearly record setting. This defense attorney seminar was one of the best seminars in NCDD history. Attendees commented that this seminar increased their skills in an important and emerging area of the law. 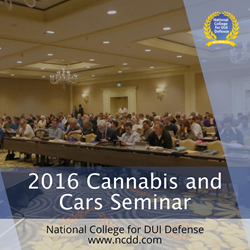 Over 170 attorneys and experts from across the country recently attended the National College for DUI Defense (NCDD) 2016 winter seminar “Cannabis and Cars” held in Santa Monica California, setting a near-record in attendance. “This defense attorney seminar was one of the best seminars in NCDD history. Attendees commented that this seminar increased their skills in an important and emerging area of the law,” said Lenny Stamm, Dean of the National College for DUI Defense. The focus of the seminar was to educate DUI defense attorneys who represent drivers accused of impaired driving in cases involving cannabis and other drugs. In connection with the seminar, the National College for DUI Defense also added a free one-day seminar in order to educate public defenders in and around California. With over 2200 members, the National College for DUI Defense is the largest organization of DUI defense attorneys in the world. Through its educational programs the College trains lawyers to represent persons accused of drunk driving. NCDD's members have extensive experience litigating issues regarding breath blood and urine tests for alcohol and other drugs. NCDD has appeared as amicus curiae in several drunk driving cases before the Supreme Court of the United States. Looking for a DUI or DWI Lawyer? Click here. Interested in becoming a member of the National College for DUI Defense? Click here.